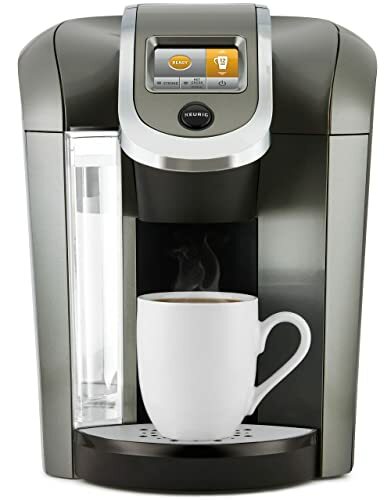 Keurig is a stellar brand responsible for bringing the single serve coffee maker to market and popularizing this convenient push-button brewing method. With pod sales accounting for billions of dollars in sales, Keurig might be a one-trick pony but it’s incredibly successful nevertheless. Today, we’ll look at 7 of the best Keurig coffee makers so you can examine a broad swathe of the impressive range at a glance. We’ve tried to select machine for every taste and budget so read on to simplify your buying decision if you’re thinking of going Keurig. If you’re stuck for choice with what coffee pods to use, we’ll also explore 10 of the finest capsules at your disposal. How about if something goes wrong with your Keurig? We’ve got you covered there too. We’ll break down the most common problems users encounter with these nifty appliances then show you how to solve them. For a single serve coffee machine that gives you a great deal of scope to customize your coffee, the K-Elite is our #1 pick from Keurig’s impressive range. Whether you want your coffee long or short, strong or weak, hot or cold, you’ll be spoiled for choice with this single serve beauty. Get each day started with piping hot coffee in less time than you’d take to boil a kettle. Grabbing our runner-up spot in the best Keurig coffee makers is the legendary K-55. This classic single serve machine is ideal if you’re not much of a tech-lover and you’re happy with a standard coffee without too much by the way of customization. If you want top-notch coffee in a matter of minutes at a very affordable price point, you can’t go wrong with the K-55. We’ll get straight down to it now with the 7 best Keurig coffee makers so you can get the right machine fuss-free. 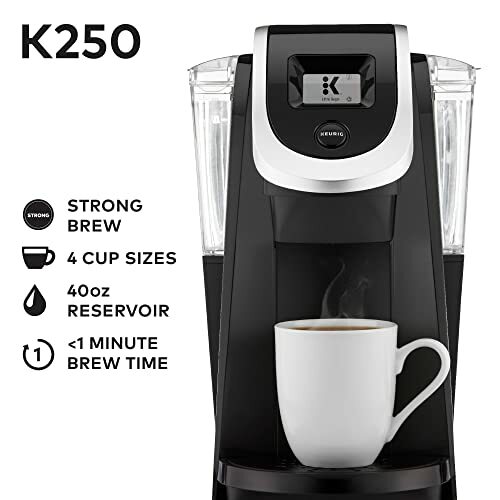 If you like the idea of a convenient single serve coffee machine but you’d like a little more control over the brewing process than most of these units allow, the Keurig K-Elite (also known as the K-40) might be just what you’ve been waiting for. With a bulky water reservoir good for up to 8 large coffees, you won’t be constantly scurrying for a refill. You’ve got 5 choices of size from a dinky 4oz shot through to a longer 12oz coffee. By slipping out the removable drip tray, you’ll even be able to slot in a much taller travel mug if you can’t get enough of coffee on the go. You can see the water level clearly from the side and back. Blue LED backlighting is a lovely extra. You can remove and clean the reservoir with ease but you’re better not popping it in the dishwasher. The control panel is a cinch to navigate. You’ll be able to fine-tune the temperature in the range of 187 to 192 degrees. You can also adjust auto off/on in 15-minute chunks. A sun icon indicates the auto-on feature is activated while a moon shows auto-off is enabled. Beyond this, you can also hit Bold if you want a stronger caffeine fix or opt for a mouth-watering iced coffee at the press of a button. The K-Elite gives you much more scope to personalize your drinks than the majority of single serve machines and this is one of its key selling points. If all this choice of drink is still not enough, the dedicated hot water function gives you the option of racking up some herbal tea or a relaxing hot chocolate if you have the jitters from too much coffee. With none of the galling bar-code limitations of the 2.0-generation of Keurigs, you’ll be able to use just about any K-Cup pod maximizing your choice and allowing you to save money over time. You’ll get everything you need to get going directly out the box with a starter pack of 6 K-Cup pods, a water filter and your sleek single serve machine. 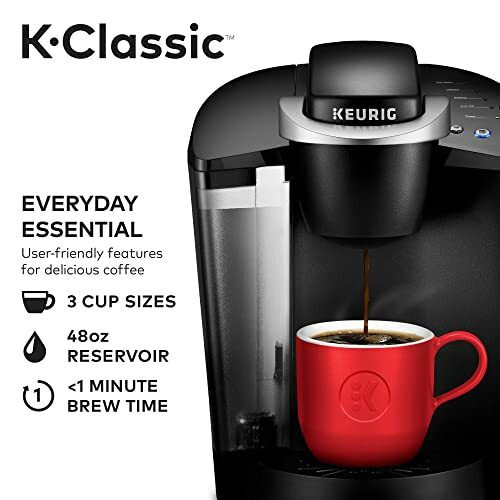 If you want an updated version of a classic coffee machine with maximum versatility, the Keurig K-Elite is tough to beat. Keurig’s timeless K-55 should need no introduction. 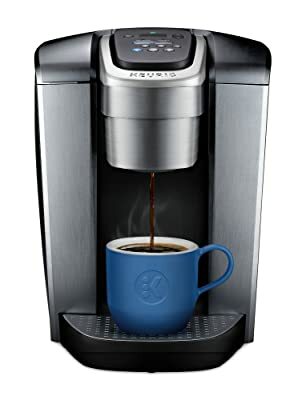 Since coming out the blocks with the very first single serve coffee machine, Keurig continue to innovate and bring you the very best that home-based coffee makers have to offer. The K-55 is functional design-wise without being likely to steal any awards. There’s too much plastic to achieve a premium look but if you like your appliances simple and stripped-down, the Keurig carries this off. Sadly, this preponderance of plastic components means the K-55 is rather less rugged than many machines with more metal. Aside from being limited to 110/120V, this is the only real gripe with this nifty little single serve machine so what does it do well? Speed and convenience are the driving reasons for most people purchasing a single serve machine. While you’ll enjoy less control over the brewing process, you get coffee incredibly swiftly with the minimum of fanfare. After the initial 4-5 minutes required to heat up your water, you’ll be sipping coffee in well under a minute which is tough to beat. In terms of pods, you’ll get none of the bar code shenanigans locking you in to proprietary pods. You’re good to go with just about any K-Cup pod and you’ll get a pack of 6 thrown in to get you started. There’s not much latitude when it comes to customizing your drink. Choose from 3 brew sizes and that’s about it. The main freedom of choice comes in the pods you can choose with hundreds of styles from almost 100 manufacturers meaning you’ll never get bored. Cleaning and maintenance couldn’t be much more straightforward and, despite the glut of plastic, if you look after your Keurig K-55, you should get years of gourmet coffee at home without bankrupting yourself. Considering the ultra-affordable price tag, the Keurig K-55 shows no signs of dipping in popularity so pop one on your shortlist! Stepping up the Keurig range slightly in terms of price, the K-575 is a more robust and versatile single serve machine offering you more flexibility across the board than the entry-level K-55. With a water filter thrown in and a substantial 80oz tank, you’ll be able to rattle off enough coffee for the whole family without scurrying for a refill. In terms of the water temperature, you’ll be able to flick through 5 settings until you settle on the one you love. This is a 2.0-generation Keurig you’ll be restricted to using K-Cup pods with a specific barcode. If you don’t fancy trying to bypass this, consider investing in a reusable filter so you can press your favorite pre-ground coffee into commission. With hot water on demand, you’ll also be able to enjoy a range of infusions, herbal tea or a relaxing hot chocolate as you ease toward bed. With a simple but effective touch screen, you’ll be able to program your Keurig to splutter into life at a designated time. If you’re always rushing around in the morning, this is a valuable touch. If you set aside the fact the coffee comes out slightly weak for some likings and the limitations concerning capsules, there’s little else to knock about this powerhouse single serve coffee machine. 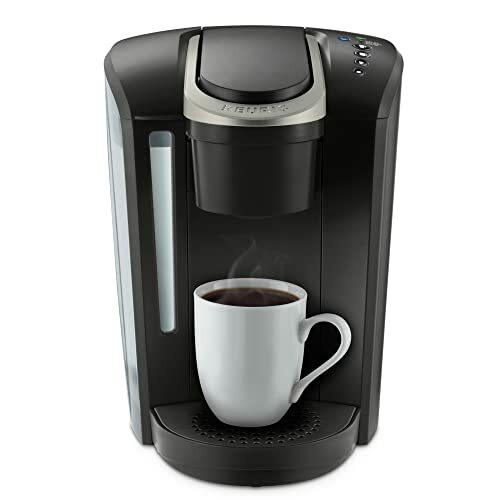 Check out the Keurig K-575 if you prize speed and convenience over controlling the brewing process. This compact unit delivers in fine style. Pitched somewhere between the K-55 and the K-450, the affordable K-250 is a compact single serve machine that punches above its weight. While it comes with a great deal of plastic, that’s no more than you’d expect at this price point and you’ll still be rewarded with that classic Keurig aesthetic. Very slim and lightweight, this machine works well even if you live in a small apartment without too much counter space in the kitchen. As with all Keurig 2.0 machines, you’ll be tied in to K-Cup pods licensed by Keurig. If you find this tiresome, you’re probably better off avoiding this type of machine completely. Hot water on demand allows you to expand your repertoire but let’s face it, you don’t buy a single serve coffee maker to perform the job of a kettle. Assuming you’re OK with the pod situation, you can enjoy a vast array of drink sizes whether you want a short or long coffee. If you want to use a carafe, the K-250 allows you to do so but you will need to buy the carafe separately which is slightly tiresome. That said, given the extremely low price, you can’t expect too much by the way of accessories and extras. Cleaning can be off-putting with some coffee machines but Keurig has made sure you need to do little besides occasionally cleaning the detachable components and periodically descaling. Take care of these basics and you should get at least 18 months to 2 years of solid use from your K-250 before any real chance of problems developing. For an ultra-compact machine with very robust performance, the K-250 makes a smart bet. 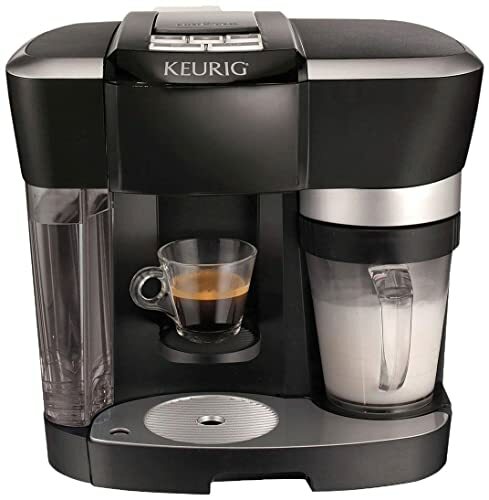 The Keurig K-Select, also know as the K-80, is one of the many new single serve machines Keurig continues to develop. 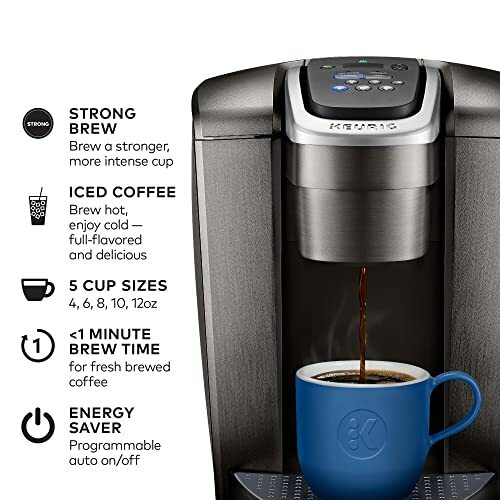 Each successive iteration seems to herald small but welcome changes and demonstrates that Keurig will not rest on their laurels. Speed is one of the most important elements with single serve coffee machines and, according to Keurig, you’ll get coffee in less than a minute. This holds true once the machine is up and running but when you first power up you’ll need to wait 4 minutes or so for the water to reheat. If you’re busy and want coffee in a hurry, you’re in safe hands with the K-Select. In addition to the 3 standard sizes of drink, you can finally choose a 12oz brew with the K-Select which is perfect if you insist on coffee as you commute. You can also opt for a stronger coffee by hitting the Bold button. While you won’t get too much more by the way of control, you should still get a golden cup of coffee with almost no effort on your part. As a refreshing change from the samey color schemes of most kitchen appliances, you can roll with the K-Select in brighter designs if you fancy. Compared to the K-55, you’ll get a slightly bigger water tank, an extra 12oz cup size and the ability to tweak the brew strength. If you already own a K-55 and don’t feel these additions would be worthwhile, there’s no need to upgrade. If you’re on the trail of a new machine, though, you should certainly pop the K-Select on your shortlist. 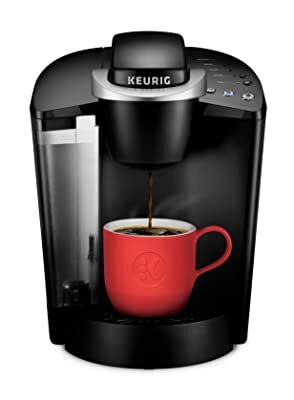 If you’re hunting for a coffee machine that goes beyond making the same regular cup of joe, Keurig’s flagship K-Café is worth further investigation. 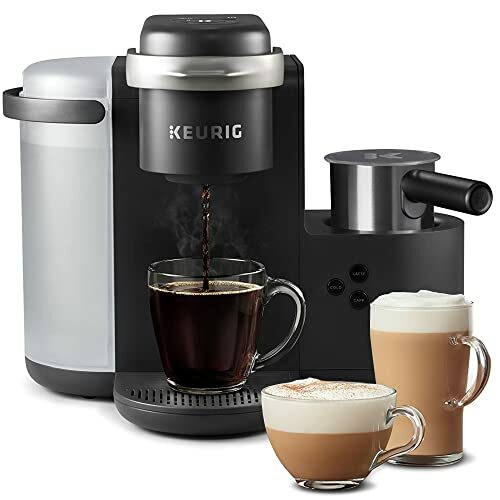 The K-Café is the first Keurig that comes with an integrated frother so if your taste extends to milky confections like latte or cappuccino, this machine might be just what you’ve been waiting for. While most Keurig’s look very similar from a design standpoint, the K-Café is strikingly different. The heating system and controls in the middle are flanked by the water reservoir on the left and the frother sitting to the right. There are 4 brew sizes to choose from (6oz, 8oz, 10oz, 12oz) and you can opt for a 2-oz shot if you like drinking latte. If these frothier drinks are your preferred poison, you’ll love the onboard frother. You have 3 settings for latte, cappuccino and also a cold foam option. Whether you want regular fresh milk, almond or coconut, pep up your long drinks without needing to head to the coffee shop. With a 60oz capacity, the water tank gives you enough for 6 coffees so there will be plenty for all the family. Cleaning and maintenance are both a cakewalk as with all Keurigs. Aside from periodic descaling and a weekly rinse down of the reservoir, there’s not much more to it. The only real gripe with the K-Café is the fact you can’t manipulate the temperature of the water. Considering the convenience and spread of choice you get at a reasonable price point, this is hardly a deal-breaker. If you’re looking for a quickfire single serve coffee maker offering you hot and cold drinks with or without milk, the K-Café gives you this versatility at a very reasonable price point. The Keurig Rivo might be a discontinued model but it still attracts a loyal following. A cappuccino and latte machine capable of serving up hot or cold drinks with push-button convenience, we still recommend considering the Rivo when you’re weighing up which Keurig to buy. The Rivo is a flawed gem that’s paved the way for newer iterations like the K-Café so where does it stand and fall? Rather than using K-Cup pods, you’ll be restricted to the Lavazza Rivo range of pods where you’ll get 3 choices of espresso in varying strengths alongside a decaf option. While you’ll be able to jazz up your drinks thanks to the frother, be aware that your baseline choice of coffee will be sorely limited. The onboard frother is a wonderful touch that lets you make latte or cappuccino if you tire of straight-up espresso. You’ll also be able to generate cold froth for an iced drink on those hot summer days. You can fire up the frother while you’re racking up your coffee so there’s no wasted time. Although it’s a pretty slender unit, the 60oz water tank is large enough to make 6 drinks without refilling. If you’re looking for a simple but effective push-button espresso machine that also gives you the scope to make other drinks, the Rivo is still worth popping on your shortlist. This coffee is a consistent bestseller. It’s a winning mild roast that hits all the right notes for that perfect golden cup. Described as deliciously smooth with a nutty and rich flavor and just a hint of sweetness, this K-Cup pod is a smart bet for an easy workday cup of coffee, or to accompany a leisurely Saturday morning with the newspaper. Green Mountain is made by the same company that makes the Keurig machines. Who doesn’t love a classic cup of coffee from the donut shop? Unfortunately, most of us don’t have time to pop through during our morning commute and also the expense soon mounts, so this offering from the Original Donut Shop is sure to please. The aroma is sweet, and the flavor is nutty. This K-Cup is a delicious medium roast blend and is of course perfect when paired with your favorite donut! You won’t find any bitter aftertaste here, and you’ll have no problem using this K-Cup pod with your Keurig machine. This brand of coffee is more of a novelty but seems to be increasing in popularity pretty swiftly. The company’s claim to being “the world’s strongest coffee” is questionable but there’s no doubt you’ll get quite a caffeine boost. This coffee is a super-strong, bold roast blend, and it’s perfect to have on hand after a late night or if you are just not a morning person at all. Also, these K-Cup pods are recyclable and can easily be used in any Keurig machine. Eight O’Clock is a well-known brand among single-serve coffee machine users, and it’s easy to see why. This coffee is a medium roast with a full-bodied flavor. Some describe it as having a rich, wine-like taste. There’s nothing fancy about this no-nonsense coffee and this is one of its key selling points. This particular coffee is also certified Kosher. There is a good reason so many people love donut shop coffee – it tastes simply delicious! Dunkin’ long ago hit the nail on the head with their combination of shotgun service and superb coffee, so it’s no surprise that their K-Cups are so popular, too. This coffee is exactly what millions have come to expect from Dunkin’ Donuts; it’s a smooth, rich, medium roast blend. Save the trip through the drive-thru and instead brew your own Dunkin’ Donuts coffee at home with these easy to use K-Cup pods. In addition to its taste, Caribou Blend Coffee hits some other sweet notes being certified Kosher and 100% Rainforest Alliance Certified. This is a medium roast coffee and has been described as tasting like hotel coffee. It has a smooth taste without any unwanted bitterness, and the Indonesian beans bring a fruity berry flavor to the table. This smooth cup of coffee is perfect for any morning and is sure to please even the pickiest coffee drinkers. Ah, Starbucks. You either love them or you hate them, but either way you know exactly what they are about – coffee. Their Pike Place Roast is as simple as it comes. This is a consistent blend of coffee, smooth and rich without bitterness. There’s a slight hint of cocoa and a subtle nutty taste. This medium roast blend is a cinch to make at home using your Keurig. Newman’s Own has long been a crowd-pleasing coffee, and their K-Cups continue this tradition. This Special Blend is robust, but not bitter. This coffee produces an incredible aroma, which only serves to enhance the flavor. It is smooth and full-bodied while still a medium roast, and unlike some K-Cups available, this one doesn’t leave you feeling like you have a watered-down cup of joe. This particular coffee is also certified organic by the USDA, as well as being Fair Trade Certified. This is a solid coffee to start your day off right! Tim Horton’s is a staple in Canada and has made its way across the border and around the world in recent times. 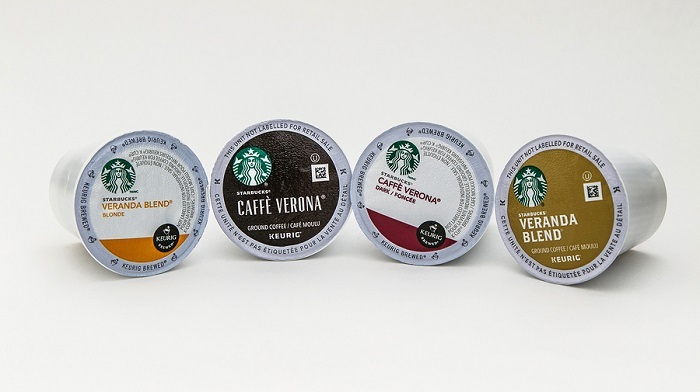 Their coffee has quite a cult following, and now their K-Cups do as well. You can find Tim Horton’s K-Cups in several varieties, but the most popular is their dark roast. It can be tough to get a dark roast just right without having an excess of bitterness, but it seems Tim Horton’s has pulled the trick off. This coffee is rich with a smooth finish and boasts a delicious aroma in addition to that trademark, robust flavor. As with a few others on this list, Peet’s is another coffee company with a cult-like following. This specific blend is their most popular, and if you like a dark roast coffee, this might be just what you’ve been looking for. It’s full bodied and strong, while still having a smooth finish with no bitterness. It has a slightly nutty flavor, and the subtlest hint of cinnamon making a lip-smacking treat any day, and a great cup of joe on a Monday morning. For most of us, our morning start with a great cup of coffee. Our days just are not the same without it. Is it the aroma filling the house or the jolt of caffeine that gives us energy for the day, or maybe it’s just the comfortable routine of making the perfect cup of joe to begin the day? Whatever it is, no one can deny that a bad cup of coffee can quickly derail an otherwise great day. These days, many people have switched to using single serve coffee makers, like Keurigs. For speed and convenience, these machines are unbeatable and you’ll get very little wastage either. Unfortunately, as with any technology or gadget, these machines sometimes develop problems but we’re here to guide you and show you how to combat these niggles. It’s enough of a hassle when you can’t get your morning cup of coffee but realizing that your Keurig machine is seemingly broken can pile on even more stress. Luckily, many of these problems have easy solutions that you can take care of at home. There is generally no need to outright replace your Keurig, or any call to send your coffee maker off to be repaired. As long as you can follow simple instructions, you can be back to brewing in no time, and that is what we are going to probe today. We will dig into some of these more common problems that seem to plague Keurig machines, troubleshoot them and explain the simple solutions to them. Keep reading so you can get your caffeine fix! Before we get into how to fix the problem, we must first determine what the problem actually is. Some of these problems experienced by Keurig owners can have multiple causes, so you might need to work through several things in order to determine what the root cause of the issue is so that you can fix it correctly. Before we get into that though, let’s make sure some of the simplest solutions are handled. Everyone has probably thought there was a major problem with something only to discover that it was something incredibly simple. That is sometimes the case with Keurig problems. It might seem silly, but make sure your machine is plugged in and that the outlet being used is functioning properly. If your Keurig has a water reservoir, make sure it has enough amount water in it. Make sure that you place a K-Cup into the machine. If none of these simple fixes seems to be the culprit of your issue, keep reading as we try to establish the instigator. 1. If your Keurig machine is refusing to turn on, there are a couple of things you can try to remedy this. Reseat the water reservoir. Many people don’t know that there are magnets in the water reservoir that must make contact with magnets in the machine. If these magnets don’t connect then the Keurig will not function as intended. Remove the water reservoir from your Keurig, and then set it back in place making certain it’s properly seated. 2. Perhaps your Keurig is powering on and off on its own. The fix for this is pretty simple, no matter which model of Keurig you own. Shut off the Auto-Off function. If you own a Keurig Mini, the machine has a hardwired Auto-Off function that you cannot disable. Instead you need to power the machine on each time you use it and it will automatically shut off after 90 seconds of inactivity. For the Keurig Elite, Special Edition or Platinum Edition, the Auto-Off function can be disabled. On the Elite, simply press the Auto-Off button to disable the function. On the Special and Platinum Editions, you’ll need to scroll through the machine’s menu to disable the Auto-Off function. 3. If you get to the bottom of your cup of coffee and are find it full of coffee grounds, this is a straightforward fix. Clean the exit needle of the machine. Inside the pod section of the machine, there are two sharp needles. One of the needles punctures the top of the K-Cup, allowing the water to flow into the coffee and brew it. The other punctures the bottom of the K-Cup and allows the brewed coffee to flow out into your cup. If you are getting grains of coffee along with your brew, the likely culprit is a dirty exit needle. Some models of Keurig come with a small plastic tool meant for cleaning the ground out of this needle. If your machine is one of these, it makes an effective weapon. If your machine did not come with this tool, or you’ve lost it, just use a toothpick or a paperclip that has been straightened out. Be gentle so you don’t jam any loose grounds further into the needle, and don’t poke yourself! Unclog your Keurig. The most probable cause of your machine not dispensing water is a clog somewhere in the machine. These can be tricky to find, but you must get it worked loose in order to get the machine back in working order. Try running the Keurig through a cycle or two with just water and no K-cup in the basket. Clogged needles need cleaned. As mentioned, the needles of the machine sometimes get dirty. Just as the exit needle can get coffee grounds in it, the puncture needle can become clogged with grounds. Using the plastic tool, a straightened paperclip or a toothpick, try to gently work loose and clog in the puncture needle. Once you’ve removed the grounds, run your machine through a cycle with just water. 5. Over time, you might find that the coffee brewed by your machine begins to taste bad or is increasingly weak. This is because the water used to brew the coffee will create buildup in the water lines over time. To fix this problem, you need to thoroughly clean your machine by descaling it. Follow your machine’s instructions to complete this task or read our other articles for step by step instructions on how to do it right. We hope you’ve enjoyed this exploration of the finest the Keurig range has to offer. We know everyone has entirely different needs when it comes to coffee so we tried to handpick a selection suitable for all tastes and budgets without getting too repetitive. Come back if you need to refer to our troubleshooting guide for Keurig problems and drop us a line if you have any questions or feedback. Now which Keurig seems right for you?